Prince Charles visited the Paralana site, east north-east of Arkaroola, in South Australia, in 2012. 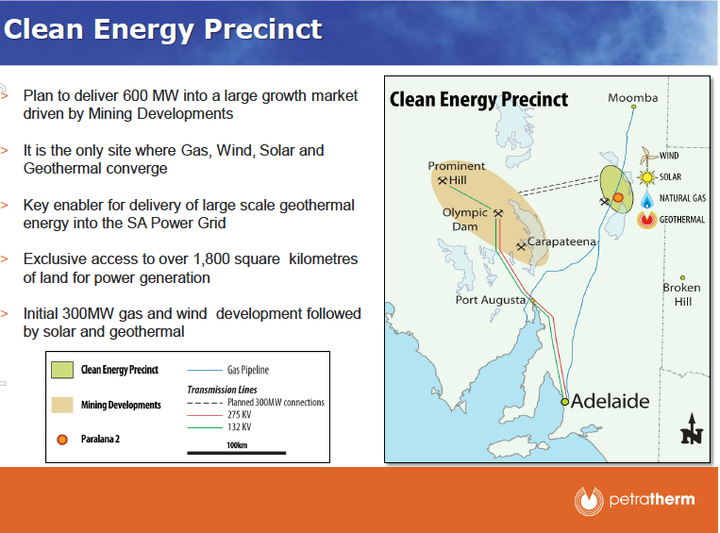 The Australian Renewable Energy Agency was poised to pump in another $37.5 mln in grants, Beach Energy was a 21 per cent joint venture partner, and there are those who still believe that if Petratherm had been able to raise a measly $5 mln to pay its share of a third well, it would have had a 3.5 MW power station up and running in 2015, supplying South Australia with zero-emission baseload power for 30 years at a capital cost equivalent to wind power. But in 2014 the wheels fell off. The GG blames Tony Abbott.� The Abbott government was so hostile to renewable energy's threat to big coal that private investors took their money off the table. They reasoned that renewables were relatively high-tech and capital intensive (especially geothermal) and without initial government support they were just too risky. THE GAMBLING GREENIE �is licensed by the South Australian government to drive a moter vehicle. He is not an adviser and has no links to the financial services industry. If he finds a guaranteed way of making serious money on the stock market, he won’t tell anyone. He may at times own shares mentioned in the column, but does not trade in any such shares for at least two working days before or after publication. They were right about the political risk -- the following year the Abbott government pushed through legislation slashing Australia's 2020 large scale renewable energy target from 41,000GWh to 33,000GWh. Petratherm, however, had anticipated this, with plans for Paralana to be not only a geothermal site, but a renewable energy hub with significant solar and wind generation as well. Alas, 'twas not to be.� For want of a nail, the shoe was lost.� The nail, in this case, was the equivalent of about $7 per South Australian household, less than the price of a beer at a footy match in 2014. Maybe it is a pity that five years ago, crowdsourcing in Australia had not really taken off. All the geothermals have had to give up and reinvent themselves. Petratherm is now a junior minerals explorer, hoping to find gold, nickel, copper� ... well, anything really.� Hopefully the next Olympic Dam. Geodynamics is now ReNu Energy,�focusing on solar and bioenergy. Its shares are worth a mere 8c each. Panax Geothermal eventually sold its stock market listing to a private technology company, Xped Holdings, whose share price is now 1c. Torrens Energy, now High Peak Royalties, is worth 6.5c.��� Hot stocks no more. Except, perhaps, Hot Rock Ltd. Now known as HRL Holdings (still HRL on the stock exchange), the company has transformed itself into an� environmental services company, buying Octief environmental services in 2014 and Precise Consulting in NZ� and AAC Environmental in the ACT in 2015. More acquisitions followed but the game changer was buying Analytica Laboratories in New Zealand in November 2017. HRL testing services now range across food, environment, buildings, construction, geology, agriculture and hazardous materials. Despite a big drop in methamphetamine testing due to a change in government policy in New Zealand, Analytical has done so well that HRL has had to pay the vendors an extra $2.5 mln and expects to pay a similar top-up in the future. The company has been investing heavily in software and testing facilities, which, given the track record of cutting-edge technology, may not always fly. However it has been flying nicely so far, with sales up 22 per cent to $14.1 mln in the six months to the end of December. �The big drivers were testing the authenticity and origin of food (up 85 per cent) environmental testing (up 55 per cent) and dairy and honey quality testing, both up 29 per cent. The statutory loss, after tax, was a hefty $4.22 mln, up� $4 mln on the corresponding period, but almost all of that was due to one-off costs associated with the Analytica and other mergers. �Underlying profit was halved, to $711,000, but at least it was positive.� That drop was at least partly due to the 43 per cent drop in meth testing, which is being replaced by newer tests, albeit at a lower margins. 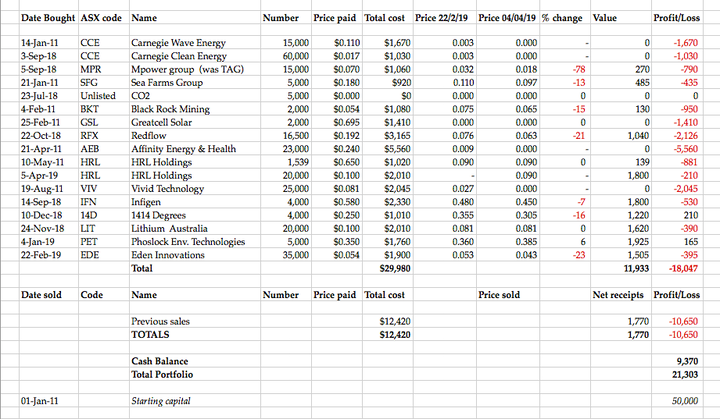 The GG bought HRL shares in 2011 when it was still a hot stock. He has now decided to test his intestinal fortitude by buying 20,000 more HRL at 10c each. Hopefully HRL will not test his internals as severely as Carnegie Clean Energy (CCE), Mpower (MPR), Greatcell Solar (GSL), or the former CO2-absorbing AlgaeTec, now known as Affinity Energy and Health (AEB). (Deep sigh.) �They all seemed like such a good idea at the time.